I've decided to re-Tag some of the posts here to make it easier to understand what they are for. Several of my posts are now Tagged as a "Skill" and no longer a "Drill". So what's the difference you ask? Skills - These are items to use to build up your proficiency in a particular area, such as Skating, Passing, etc. They are repetitive motions that are designed to help you become better at something. Drills - In my mind, these are workouts that focus more on game type scenarios and help you think through the playing of the game. 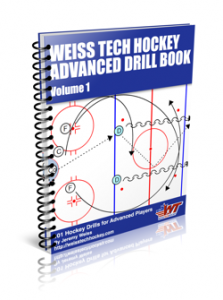 While it may be a small part of what actually happens during a particular play, the "Drills" should be easily translated into a game situation. Drills will still reinforce the 'Skills' but they don't seem so repetitive and boring to the player. I'm hoping this separation makes it easier for coaches to build up skills for a particular player or teach game type situations.